It may not be a coincidence that college started to get a lot more expensive when schools began restricting who could attend, then spent millions of dollars on facilities to compete for the students they wanted. Costs surged and so did tuition. Now that millions are paying off student loans the size of small mortgages, policymakers are looking for ways to make college more affordable. In some states the legislature has enacted laws that guarantee a tuition level for students during his or her enrollment. The goal is to make college costs more predictable and affordable. It may do that for some students, but researchers at the University of Illinois say these laws have unintended consequences that may make college less affordable in the long run. Researchers Jennifer Delaney and Tyler Kearney have published a study examining guaranteed-tuition laws and their impact on mandatory student fees and out-of-state student enrollments. These are important alternative revenue streams for colleges that are not subject to the laws. With guaranteed tuition laws in place in Illinois, Texas, and Oklahoma, costs got shifted around. From 2000 to 2012, public colleges and universities in the states that have these laws increased mandatory student fees by 40%. They also raised their out-of-state tuition by 28%. When they did that, out-of-state student enrollment dropped by 23%, putting public colleges and universities even deeper in the hole. The effects were even more severe at universities specializing in doctoral programs and research. "These findings suggest that guaranteed-tuition programs are not beneficial for either in-state or out-of-state students," said Delaney. She notes that institutions barred from getting money from one source will just get it from another. So how do you make a college degree more affordable. The simple answer may be to obtain it from an institution that specializes in online programs. Previously offered mostly by expensive for-profit schools, a number of quality, non-profit colleges have built up their online degree programs, and some have reduced tuition costs to reflect the savings. Southern New Hampshire University was a pioneer in this area, with a national advertising campaign promoting its online degree programs. Other non-profit schools quickly followed suit. 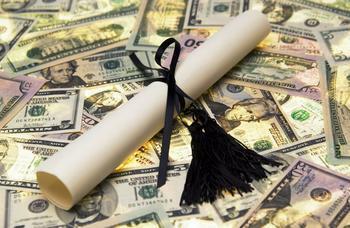 Today, there are a number of schools offering online degrees that typically cost less than pursuing a degree on campus. Earlier this year, we profiled five of them here.